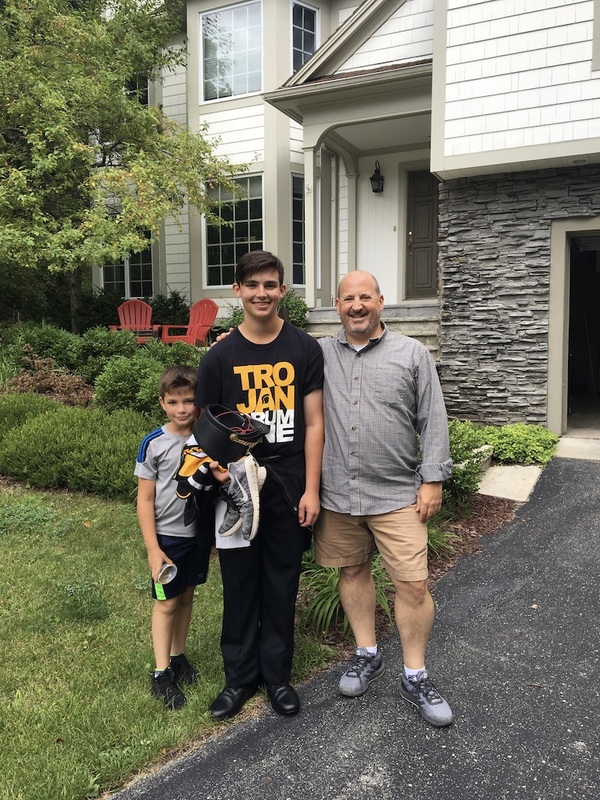 Steve just sent me this photo of him and the boys. Paco starts high school next week, but Paco and the marching band are playing for the first football game of the season tonight. Paco attended a music camp about a month ago. Will post those pictures soon. Am in Santa Clara with Patricia and Clark. Clark is recovering from having an abcess tooth pulled Tuesday morning before we left Sacramento. 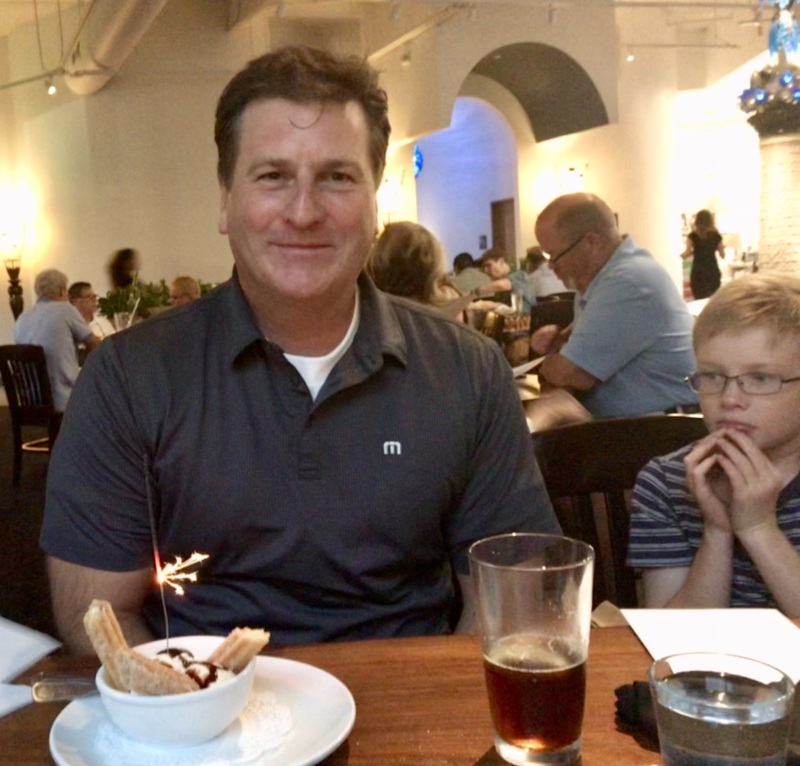 Last night we had a belated celebration of Brandon’s 51st birthday which was on Wed., the 22nd. 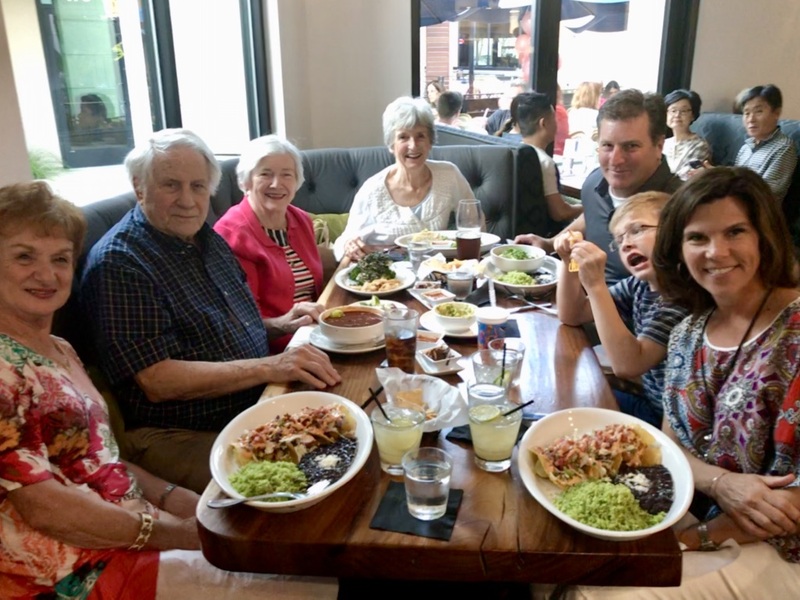 We went to Zócalo in UV (University Village) for dinner. My sister Patricia had just arrived from Denver earlier in the morning. She will be here for 2 1/2 weeks of bridge including the Regional in Santa Clara where we will head next Tuesday. Joleen Hecht (Lisa’s Mom), Clark, Barb, Patricia, Brandon, Beckett, and Lisa. That pile of greens in front of me is a delicious kale salad on top of grilled broccoli with goat cheese and green goddess dressing. Clark liked his pozole rojo (pork and hominy in a red broth) and the others, their tacos. Happy Birthday from Zócalo!! The waitress brought a dish of ice cream and churros and a sparkling sizzler. Beckett looks a little apprehensive. 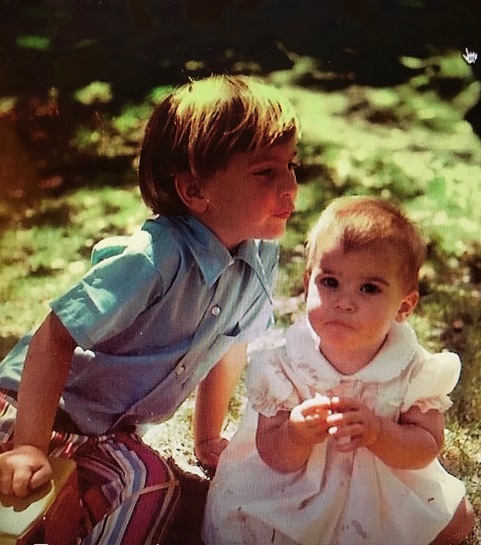 And today is my sister Joan’s birthday. She lives in Alamo, near Walnut Creek. Happy Birthday, Joan!! 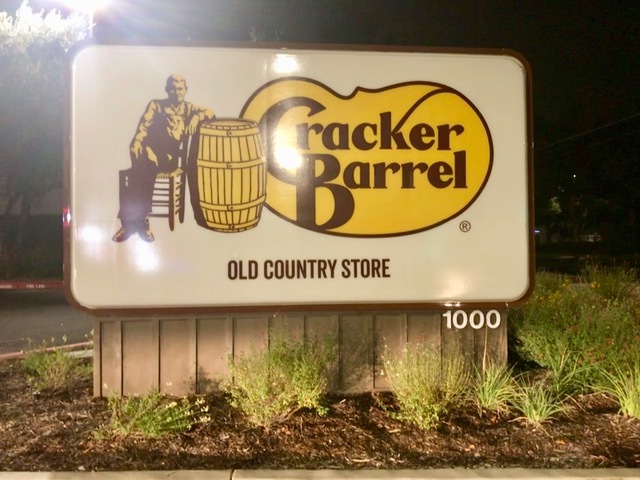 Last Monday the New Cracker Barrel Restaurant opened in Sacramento. It is at 1000 Howe Ave, about a mile from us. We pass the restaurant almost every day on our way to bridge. Twice we have driven into the parking lot, thinking that we would peek inside, but every parking space was taken. We see long lines of people sitting in wooden rockers watiing outside to get in to eat. Land was broken in October 2017 and about 6 months ago this sign went up. The spot was formerly occupied by the New Canton Buffet which we went to on a number of occasions when Paco and Tommy were in town. We liked it because there was something for everyone. Clark could get his Chinese food, Paco would order from the grill, and I could get baked fish, steamed veggies, and pot stickers. Tommy liked the ice cream. Last night on our way home from bridge about 9:45 pm, Clark made a turn into the parking lot and there were a number of available spaces. So, since we had not really eaten dinner before bridge, we stopped and the hostess said that they were still serving and she seated us right away. The interior walls are covered with lots of memorabilia. Clark is surveying the large menu. 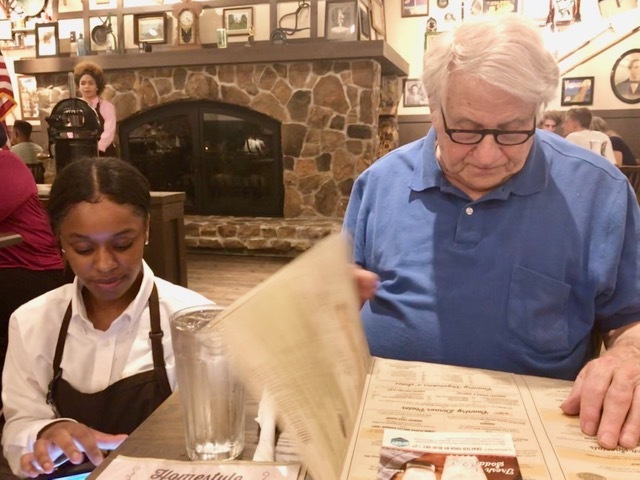 The cute little waitress knelt down next to Clark and entered his order on her computer. 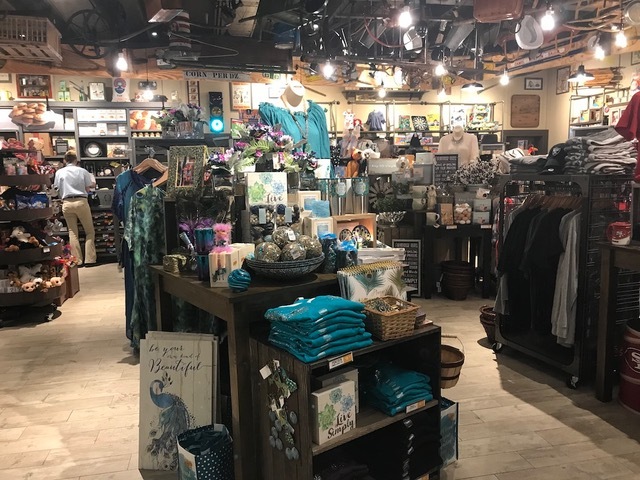 The store is packed with goodies. I ordered the Lemon Pepper Grilled Rainbow Trout country dinner plate for $7.99. It came with 2 sides. I ordered the turnip greens and the kale, brussels sprouts. pecan salad. 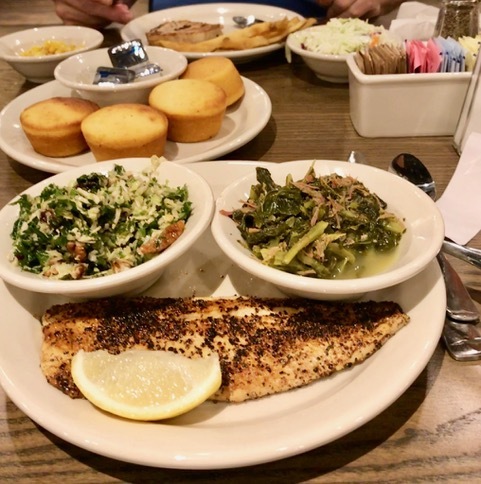 The trout and turnip greens were delicious. The salad was good, but was way too sweet. 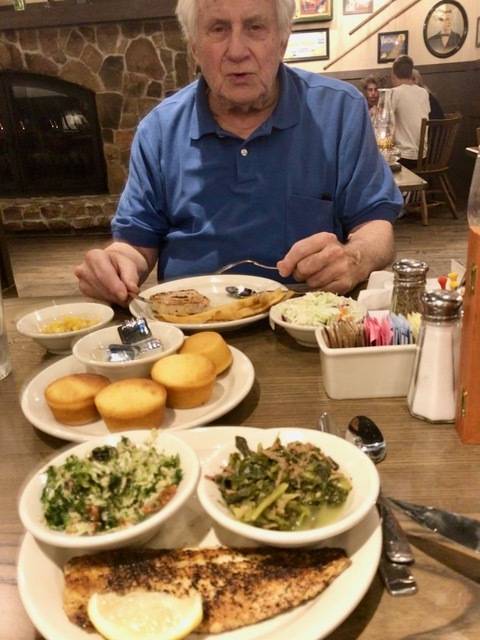 The dinner also came with a choice of corn bread or biscuit. I ordered the corn bread for Clark to bring home. Clark had the pork chop with sides of fries and cole slaw for $7.99. They mistakenly brought an extra dish of corn to the table. That’s Clark exiting with his take home goodies of fries, cole slaw, and corn bread. Today was Brandon’s birthday. To celebrate he went to Oakland on the train solo to go to the Oakland Alameda Coliseum for the 12:35 A’s game. He wished that the Swinging’ Rage Mitchell Paige (Brandon’s favorite A) was around to see it. On Facebook Colleen posted this photo of Brandon and Erin taken on Brandy’s 5th birthday. Erin would have been 11 months old. For once, I understood what Brandon and Colleen were talking about when they post on Facebook! Steve wrote this morning that Tommy has discovered that he likes fishing. He used a pole that Clark had given the boys a few years ago. 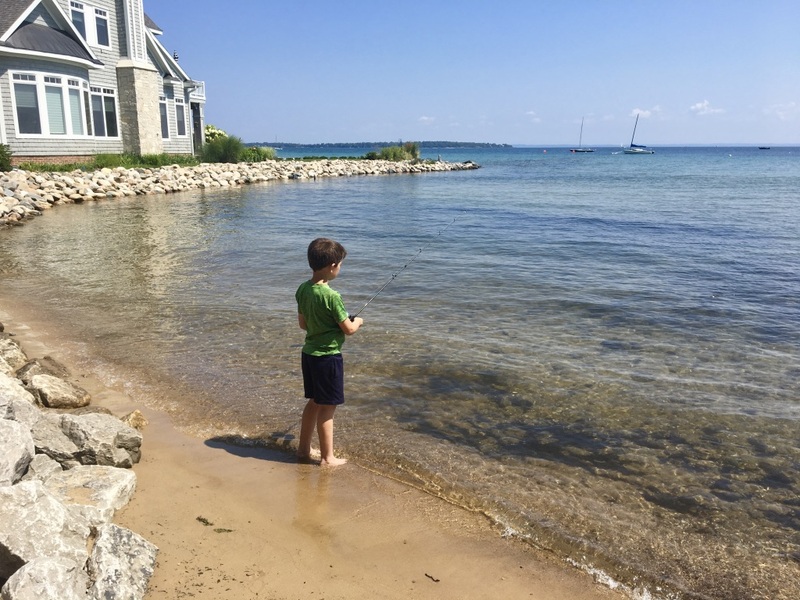 Tommy is fishing in Grand Traverse Bay in Northport, MI, a village about 25 miles north of Traverse City. 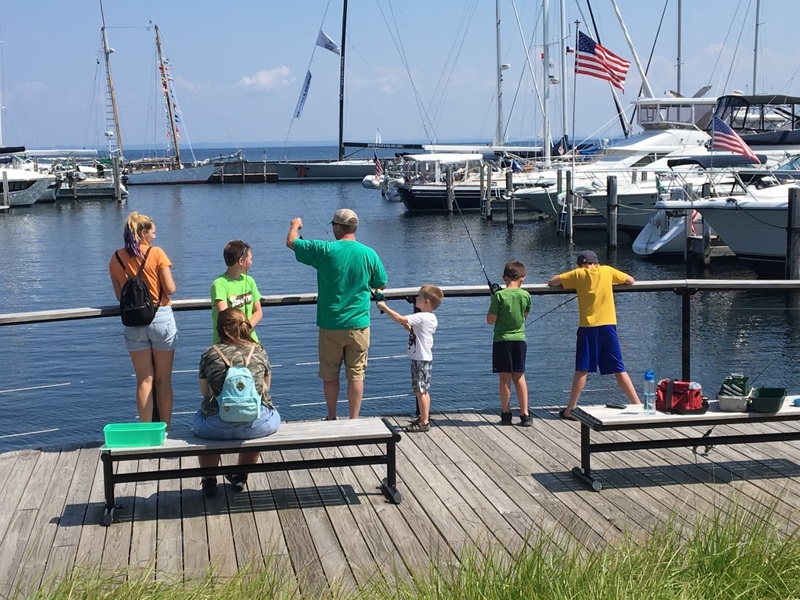 Northport is at the northern tip of the Leelanau peninsula on Lake Michigan. That is Tommy in the green shirt. Steve and Tommy were fishing and those other boys in the photo (a family from Iowa) invited Tommy to join them. They taught him all about the different fish and about which bait to use. Steve said that the boats in the harbor were amazing. 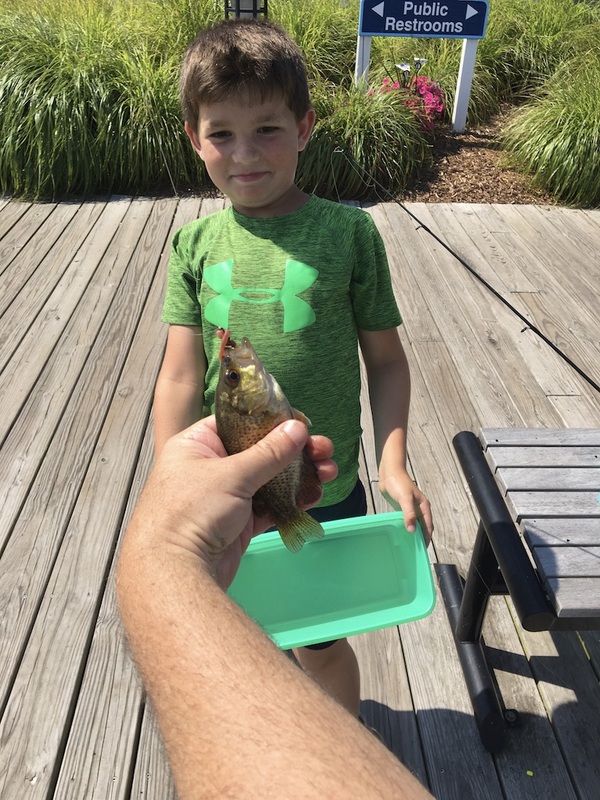 Tommy caught a rock bass. They did catch a little perch, but didn’t get a picture. The body of water to the left of the peninsula is Lake Michigan. Grand Traverse Bay is to the right of the peninsula. Today would have been the 90th birthday of Joe Zavadil, husband of my sister Patricia. Joe was an amazing combination of brains and charm and good looks. Patricia and Joe met at daily Mass at the Newman Club at Stanford, where Joe was working on a PhD in English and Patricia had just enrolled to study for a Master’s degree in English. Joe was tall, dark, and handsome. He was a wonderful conversationalist. Patricia and Joe were married in 1959. 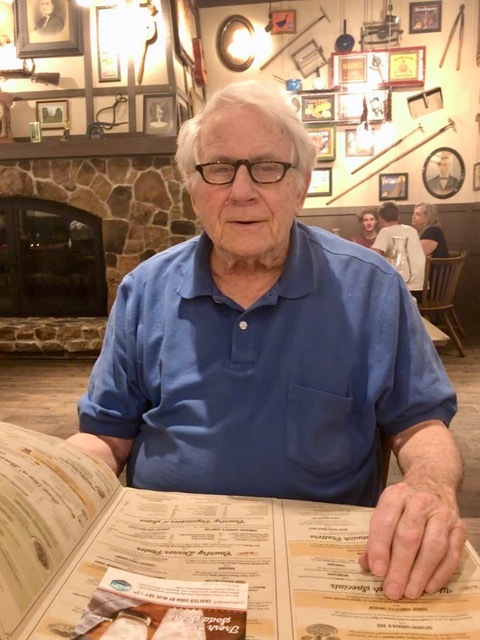 After obtaining his doctorate from Stanford in 1961, Joe took a job on the English faculty at the University of New Mexico in Albuquerque where he taught until his death in 1992. He was survived by Patricia and their 6 children. 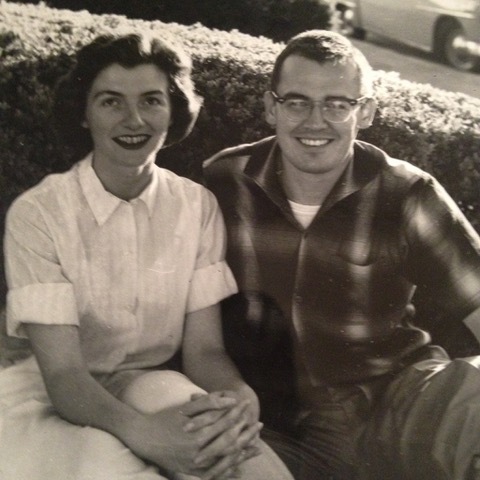 Patricia Canty and Joe Zavadil in July 1959. 30 inches long and weighed 3 lbs. 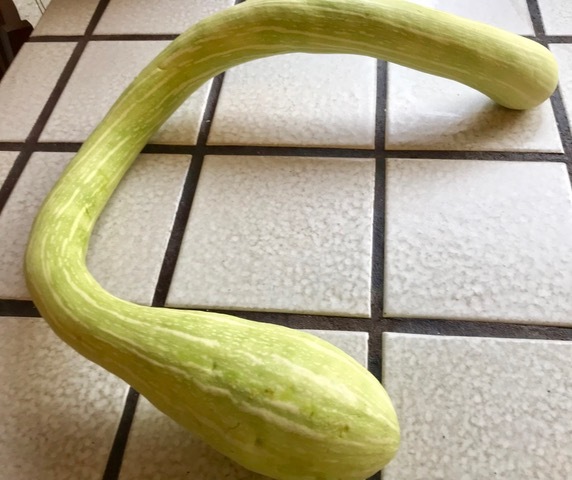 Guess we will be eating zucchini for a while!